No new files have been created on the filesystem. No files have been extended. The filesystem is able to be unmounted. Warning: I have test this in my test server. This is undocumented one. You may facing the critical problem when you follow the below steps on your systems. So try this at your own risk. Please avoid directly try this with your production servers. Here is the output for your reference. You can get deleted files inode if you don’t have. 261932 kilobytes total disk space. # fsdb /dev/fslv00 à use the “fsdb <lv_name>” to recover the deleted file. # fsck -yp /dev/fslv00 à run fsck to repaired the inconsistencies. Superblock marked dirty because repairs are about to be written. tree have been detected. Will reconnect. All observed inconsistencies have been repaired. # mv 4 film à change the name of the recovered file to the old one. -rw-r–r– 1 root system 68 Apr 03 16:49 film à the deleted file has been recovered. There is an easy way to access to Instance information from within. This is very useful when writing scripts who are executed inside the Instance. The method is accessing the Instance Metadata using a HTTP GET call to the IP 169.254.169.254. It works on any EC2 instance and the IP address is always the same. Check the Instance Metadata manual page for further reference. Unfortunately, the Instance Tags are not available through Metadata yet (forums). There is a workaround using the API ec2-describe-instances command. You must know that sar is a very effective tool to collect system activity or performance information from your system. Sometimes, you would like to make graphs from these data, because diagrams are clear and better understandable than plain data. The best way to create graphs from output of sar is kSar that is an Java-based application with gui. This program can process sar text output and make diagrams from them, also it can save graphs as picture or export them into a PDF file. Now, you can import text file into kSar, with “Data/Load from text file…” menu entry. Also, kSar has other useful functions, like remote sar running via SSH, for more details read kSar documentation. This is good for testing, but it’s better to use IAM roles covered in Option 2. You can not add an IAM Role to an existing EC2 Instance; you can only specify a role when you launch a new instance. This won’t send data to Cloudwatch. Test that communication to Cloudwatch works and design the command you’ll want to cron out in the next step. Now that you’ve tested out the command and figured out what you want to report it’s time to add a Cron task so it runs ever X minutes. Usually 5 minutes is good. One way to verify the cron job ran is to look in the cron log. 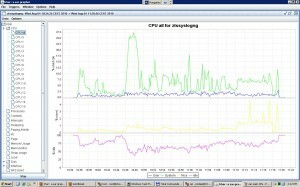 –mem-util Collects and sends the MemoryUtilization metrics in percentages. This option reports only memory allocated by applications and the operating system, and excludes memory in cache and buffers. –mem-used Collects and sends the MemoryUsed metrics, reported in megabytes. This option reports only memory allocated by applications and the operating system, and excludes memory in cache and buffers. –mem-avail Collects and sends the MemoryAvailable metrics, reported in megabytes. This option reports memory available for use by applications and the operating system. –swap-util Collects and sends SwapUtilization metrics, reported in percentages. –swap-used Collects and sends SwapUsed metrics, reported in megabytes. –disk-space-util Collects and sends the DiskSpaceUtilization metric for the selected disks. The metric is reported in percentages. –disk-space-used Collects and sends the DiskSpaceUsed metric for the selected disks. The metric is reported by default in gigabytes.Due to reserved disk space in Linux operating systems, disk space used and disk space available might not accurately add up to the amount of total disk space. –disk-space-avail Collects and sends the DiskSpaceAvailable metric for the selected disks. The metric is reported in gigabytes.Due to reserved disk space in the Linux operating systems, disk space used and disk space available might not accurately add up to the amount of total disk space. –memory-units=UNITS Specifies units in which to report memory usage. If not specified, memory is reported in megabytes. UNITS may be one of the following: bytes, kilobytes, megabytes, gigabytes. –disk-space-units=UNITS Specifies units in which to report disk space usage. If not specified, disk space is reported in gigabytes. UNITS may be one of the following: bytes, kilobytes, megabytes, gigabytes. –aws-credential- file=PATH Provides the location of the file containing AWS credentials.This parameter cannot be used with the –aws-access-key-id and –aws-secret-keyparameters. –aws-access-key-id=VALUE Specifies the AWS access key ID to use to identify the caller. Must be used together with the –aws-secret-key option. Do not use this option with the –aws-credential-file parameter. –aws-secret-key=VALUE Specifies the AWS secret access key to use to sign the request to CloudWatch. Must be used together with the –aws-access-key-id option. Do not use this option with –aws-credential-file parameter. –verify Performs a test run of the script that collects the metrics, prepares a complete HTTP request, but does not actually call CloudWatch to report the data. This option also checks that credentials are provided. When run in verbose mode, this option outputs the metrics that will be sent to CloudWatch. –from-cron Use this option when calling the script from cron. When this option is used, all diagnostic output is suppressed, but error messages are sent to the local system log of the user account. –verbose Displays detailed information about what the script is doing. –version Displays the version number of the script. What process is listening on a certain port on Solaris? / How to find out which process listens on certain port on Solaris? Scenario: I’m looking for PID for which PORT 2817 is using here in Solaris 11. Here is a script, I found somewhere which actually works. This script worked to find PID from port number, If lsof command/utility is not available with server. Save this script as Port_check.sh and grant execute permissions using chmod 777 to this script. So, Here is PID 26222 using port 2817. 0516-1804 chvg: The quorum change takes effect immediately. 0516-1296 lresynclv: Unable to completely resynchronize volume. The logical volume has bad-block relocation policy turned off. This may have caused the command to fail. 0516-934 /usr/sbin/syncvg: Unable to synchronize logical volume hd5. 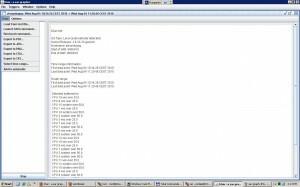 0516-934 /usr/sbin/syncvg: Unable to synchronize logical volume hd2. 0516-934 /usr/sbin/syncvg: Unable to synchronize logical volume dppmiaslv. 0516-934 /usr/sbin/syncvg: Unable to synchronize logical volume data01lv. 0516-932 /usr/sbin/syncvg: Unable to synchronize volume group rootvg. bootlist to include: hdisk1 hdisk0. bosboot: Boot image is 55324 512 byte blocks. To verify, rootvg is mirrored. We should have a 1:2 ratio between LP and PP except for the dumpdevices, like this. Now, check your bootlist. Does it have both physical disks in the bootlist or not. NUMA is not supported for larger VM sizes due to a bug in Linux kernel versions below 2.6.37. This issue primarily impacts distributions using the upstream Red Hat 2.6.32 kernel. Manual installation of the Azure Linux agent (waagent) will automatically disable NUMA in the GRUB configuration for the Linux kernel. More information about this can be found in the steps below. All of the VHDs must have sizes that are multiples of 1 MB. Note: If the package is not already installed, this command will fail with an error message. This is expected. Note: The rest of this guide will assume you are using at least the [openlogic] repo, which will be used to install the Azure Linux agent below. This will also ensure all console messages are sent to the first serial port, which can assist Azure support with debugging issues. This will disable NUMA due to a bug in the kernel version used by RHEL 6. Graphical and quiet boot are not useful in a cloud environment where we want all the logs to be sent to the serial port. The crashkernel option may be left configured if desired, but note that this parameter will reduce the amount of available memory in the VM by 128MB or more, which may be problematic on the smaller VM sizes. Note that installing the WALinuxAgent package will remove the NetworkManager and NetworkManager-gnome packages if they were not already removed as described in step 2. ResourceDisk.SwapSizeMB=8192    ## NOTE: set this to whatever you need it to be. 0 upgraded, 1 newly installed, 0 to remove and 17 not upgraded. Need to get 7,272 B of archives. After this operation, 61.4 kB of additional disk space will be used. Selecting previously deselected package zerofree.